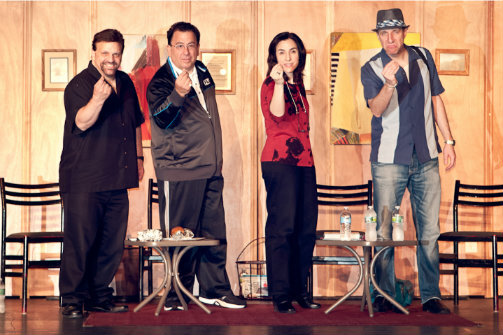 Eric Tartaglione, Joe Moffa, Tina Giorgi, and Chris Monty in Shut Up Sit Down & Eat. Photo by Steve Sage. BOTTOM LINE: Shut Up Sit Down & Eat is 90 minutes of back-to-back, Italian hilarity, a “plomedy” so relatable that a non-Italian becomes parte della famiglia. Let me preface this by announcing that, unfortunately, I am not Italian. Fortunately, in order to enjoy Shut Up Sit Down and Eat, I did not have to be. Joe Moffa (100 Centre Street) makes one thing very clear at the top of the show: “There are two types of people: Italians and those who want to be.” Upon hearing this, I was apprehensive about the next 90 minutes of show time, thinking that Shut Up would be a string of Italian inside jokes that would exclude me from the experience. However, the cast/writers of the script develop a story that’s relevant for all, addressing family relationships, aging, love, and so much more. All I had to do was sit down, shut up, and laugh with Italians and non-Italians alike. What makes Shut Up so real is that the characters play themselves, so the jokes come straight from the family table. Three boisterously funny Italian men, Chris Monty (PBS’ The Business of Comedy), Eric Tartaglione (NBC’s Last Comic Standing), and Moffa perfectly contrast the reserved and intellectual Tina Giorgi. The camaraderie between the three guidos is almost tangible, which makes the audience feel right at home. The script weaves between the characters’ personal monologues and the group therapy scenes seamlessly, making each character emotionally accessible, especially when they address the joys and challenges in both the parenting and aging processes. The nostalgia for the old-fashioned family dinner is so present that it becomes a character in itself. For a show riddled with slapstick, the script places a huge emphasis on Italian motherhood, parental respect, and the role family meals play in personal development. Joe makes a point that if you "mangia, mangia!" ("eat, eat!") with your family, you realize "just how dysfunctional everyone in your family really was." In a century where dinner times are being undermined by work and increased screen time, I left the theater wondering when (and if) my family would gather around the same dinner table. The comedic build of Shut Up Sit Down & Eat begins slowly, but momentum increases in proportion to the “Italian insanity.” What seemed louder than the four personalities onstage was the laughter of the audience throughout the entire show. The chemistry between the four players allowed for perfect comedic timing between one-liners, and the theatre was still for only a few seconds between recurring fits of hoots and giggles. While most of the Italian references in the show don't entirely escape the non-Italian audience members, some theatre-goers may feel alienated from the laughs (but only for a moment). Shut Up Sit Down & Eat is not for younger audiences, but it’s a must-see for those who seek comfort in the fact that no matter how strange your family may seem, there’s always a more dysfunctional one out there!